If you work from home, you probably know that statistics show you are more productive than if you were to work in a large office with several people. The main reason is you *supposedly* have fewer interruptions. You don’t have co-workers knocking on your office door or stopping by your cubicle asking about your weekend. In fact, statistics show that for every time you are interrupted, it can take up to 23 minutes to become refocused, so working alone can be helpful when trying to get a lot of work completed. Home offices do have downfalls however. FedEx may ring your doorbell setting the dogs into a barking spree. The kids may come home from school and start arguing or playing loudly. All of these things, and so many others, can cause disruptions, especially if you are on a conference call, GoToMeeting or Zoom call. 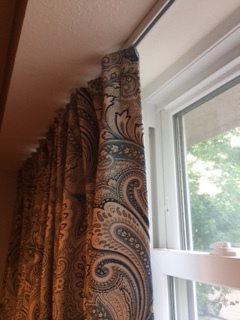 We’ve worked with customers to try to alleviate some of these noise issues in home work spaces by adding a ceiling mount curtain track with eclipse curtains around the office space. When the curtains are pulled, it helps absorb sound (perfect when you are head down into a project or on a call) plus when pulled behind you, they can give your office a uniform look around your dedicated space (concealing a concrete wall), which your boss may love. 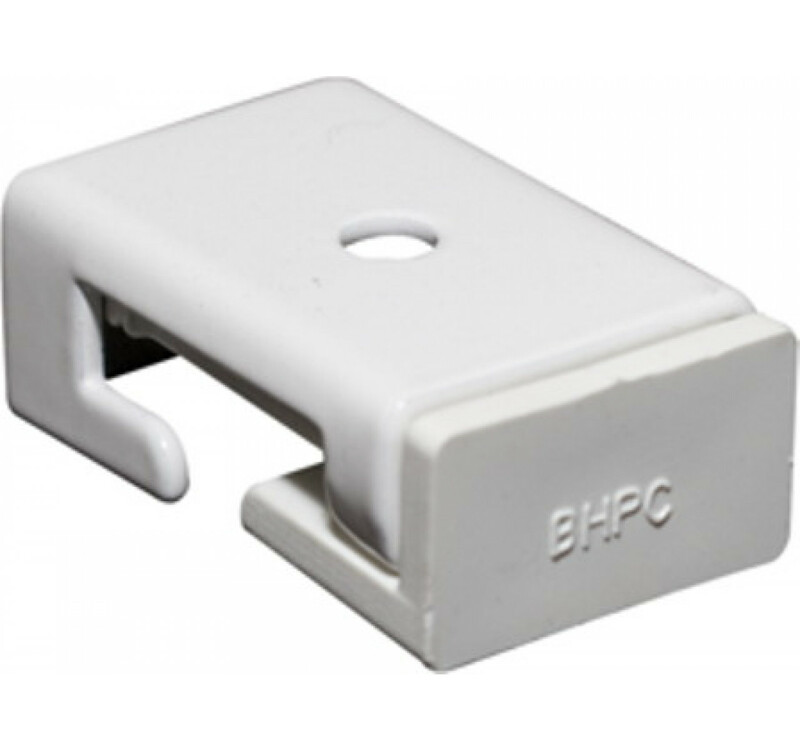 For those with a drop ceiling, our drop ceiling clamp attaches easily to the metal parts of the drop ceiling and our 6151 cartridge allows for the carriers and hooks to connect to the clamp. These ceiling cartridges are used to mount the 6100 Flexible Curtain Track and should be placed every 10 inches. The 6100 curtain track is perfect for a basement project because it allows long continuous lengths for curved or angled applications, but can also be used for straight applications. So if your home office is in a corner, you can bend the track to accommodate your work space. After you have installed your track, add the curtains of your choice. To help reduce noise, our eclipse curtains are the best and we have a vast selection of colors and sizes to choose from. If you are looking for a sound-solution in your basement office, adding curtain tracks and eclipse curtains may be just the sound absorbing solution you are looking for! Older homes, while having a ton of character and architectural detail, often have small closets and a lack of storage in the kitchen. 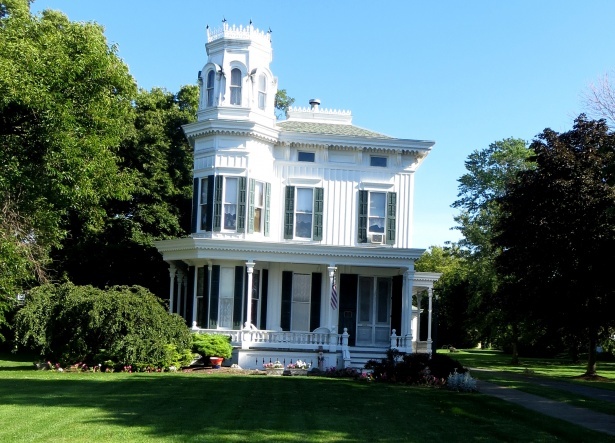 The reasoning behind the lack of space in these older homes is because at the time, individuals did not own a lot of clothing or have excess food to store. This means these fantastic looking homes need a little modern improvisation when it comes to creating space, like a pantry. Rest assured, creating a space for a pantry is easier than you may think. To create a pantry, find a small space in your home. The space doesn't necessarily need to be in the kitchen, it can be in a corner in a rarely used dining room, a section in the basement or even in the garage. Once you select your location, buy shelving units to accommodate your items. Use varying heights for your shelves which will help you maximize your space allowing for storage for tall cereal boxes and smaller spaces for canned goods. You can find a variety of shelving units at Home Depot, Lowe’s or The Container Store. Once you have your shelves put together, add the 6100 Flexible Curtain Track. This flexible curtain track allows for long continuous lengths for curved or angled applications, but can also be used for straight applications. It can be bent by hand to fit your space, meaning it works for even corner spaces. Once you have your track installed, purchase carriers like the 6111 Flexible Curtain Track Carriers. These carriers are white plastic wheel carriers with metal loop and work smoothly with the 6100 Flexible Curtain Track. Once you have your track and carriers, just add decorative curtains. We offer a variety of curtain patterns for you to choose from or you can purchase curtains that are perfect for your home decor. Once you have found your space, installed your curtain track, carriers and curtains, all you need to do when you need an item, is simply pull the curtains back. When you have everything you need to make that big family dinner, pull those curtains closed and your pantry is concealed. We’ve said it before and will say it again - curtain tracks can be used for more than just windows. Check out our other blog posts for more creative ideas! Eclipse Curtains have many features including blocking out 98% of light, absorbing sound, conserving energy and they are color rich on both sides of each panel. 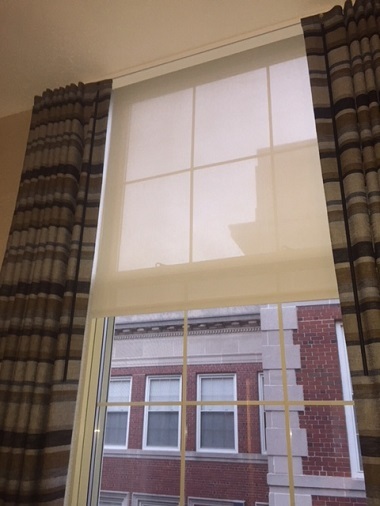 In a downtown Boston hotel, we saw some great looking eclipse curtains but the hotel was located very close to a neighboring hotel. 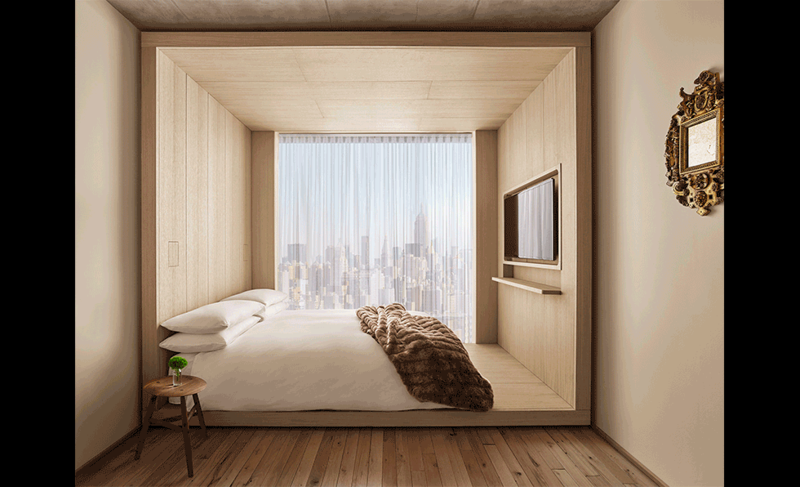 If you wanted any natural light in your room during the day, you had to leave the curtains open which meant you might end up staring at a neighbor in the hotel next door. 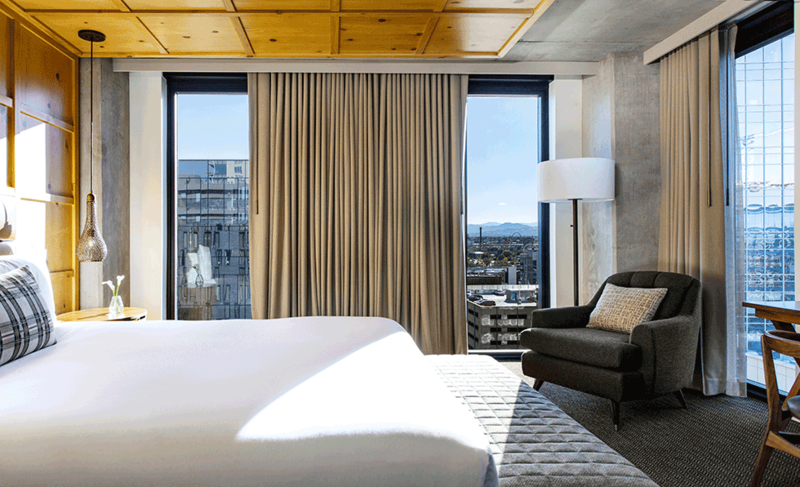 This hotel did it right though - they came up with a solution that allowed for eclipse curtains (block light, absorb sound and look great) plus they added a thin shade to the window. During the day, the shade could be pulled down allowing in light but also provide just enough shade so you didn’t have to check out your next door neighbors. Besides providing privacy, a thin shade can also be used to keep a room cool when the hot afternoon sun streams in. But if you love the look and functionality eclipse curtains provide, you can do both. We have a wide selection of eclipse available to complete the look of your room. Our curtains are machine washable and 100% flame retardant. These extremely durable curtains are available in a variety of heights and widths and you can choose from 28 different colors. When it comes to your windows, you don’t have to be committed to just one look - you can do both! Contact us an we can help you with your project! There are many therapeutic benefits to enjoying a nice, long, relaxing soak in a hot tub. The warm water can ease muscle soreness and arthritis pain and may also lead to a night of deeper sleep. But if you have an outdoor hot tub, you just may want a little bit of privacy from your next door neighbors. Curtain-Tracks.com can help! For a project like this, we suggest placing your hot tub in a serene space (or as serene as possible). That may be next to a tree or two or some bushes. 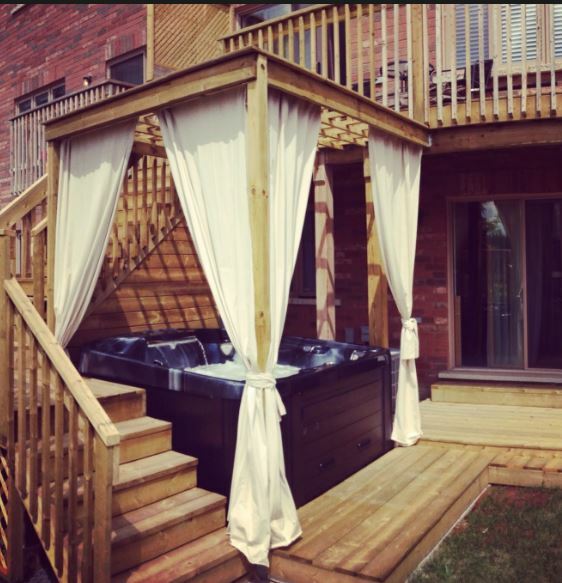 Then to enhance the space, you can add a simple pergola around your hot tub. A pergola project may seem daunting, but there are many ready-to-assemble pergola kits available and you can find the perfect design for your space. Once you assemble your pergola, you can add curtain tracks, carriers and curtains along the inside of the frame. A great track for a project like this would be the 6100 Flexible Curtain Track. One of our most popular tracks, the 6100 can be bent by hand and allows for long continuous lengths for curved or angled applications, but can also be used for straight applications. Made of white PVC with an internal metal spine, it can be mounted on a wall or ceiling. Another option is the 3118 Aluminum Ceiling Mount Track. The 3118 is a silver anodized aluminum curtain track with satin finish. Available in either 8 foot length plus 4 foot length or two 6 foot pieces (12 feet total), it mounts to the pergola and mounting brackets are not required. Once you build your pergola and add your curtain tracks, you just need to select carriers and curtains to complete your private oasis of relaxation! Ready to relax in your sprivate hot tub oasis but not exactly sure how to tackle a project like this? Give our friendly customer servoce team a call. We love to help our customers with simple and challenging projects! Gone are the dark and dingy basements of years passed. Basement spaces are now often being used as a living room where families gather for movie and game nights. Sometimes basements become bedrooms for teenagers wanting a little more space and privacy. Other times, basements are converted to home office spaces. No matter how you use your basement, you may find a need for curtain tracks, whether to divide the space into designated rooms, to conceal an ugly hot water tank, or for the most obvious reason: to use on a window. 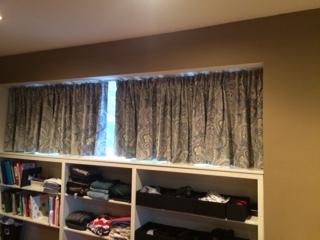 A Curtain-Tracks customer recently sent us some pictures of a completed project to cover a smaller window. They used a ceiling mount curtain track and micro-ball bearing slides. Ceiling mount curtain tracks are designed to be screwed directly into the ceiling through mounting holes or attached to the ceiling with specific ceiling mount hardware such as clips, clamps, brackets, or retainers. Some ceiling mount drapery tracks can also be recessed into ceilings as well, and drop ceiling clamps are available for the 6100 curtain track, making it easy to quickly attach the track to the acoustical grid ceiling without any drilling or bracing. We think this project turned out beautifully. Mission accomplished! If you are converting your basement into a liveable and enjoyable space and need to cover the windows for privacy, or you desire to divide the space into separate rooms, we have the products you need. Not exactly sure what you want to do in your basement space? Visit our blog where we have written about several basement projects and you just might find the inspiration you are looking for. We would love to help make your basement project a reality! Many people enjoy spending time outdoors long into the fall season. For this reason, several home builders and home owners make the most of their outdoor living space by adding pergolas for extra shade or an outdoor porch covering/roof over their patio or deck to protect from rain. If you are looking for products that can enhance your pergola or porch covering, we have a wide selection of products that work well in the outdoors and are designed and built to withstand and hold up to even the harshest outdoor conditions. Adding a curtain track and curtains to a pergola or porch can provide added protection against wind or rain and we pride ourselves on providing products that are the very best. One of these products is the 3118 Aluminum Ceiling Mount Track. It is a silver anodized aluminum curtain track with satin finish. Available in either 8 foot length plus 4 foot length or two 6 foot pieces (12 feet total), it mounts to the pergola or roof ceiling and mounting brackets are not required. If you are looking for a heavy duty track, the 3120 Extra Heavy Duty Curtain Track could be just the product you need. Available in silver or black anodized aluminum it has a thicker top wall for added support. This is a 12 foot track that is cut to 8 feet and 4 feet or 6 feet and 6 feet section for shipping. Perfect for a project that will hold heavy curtains. 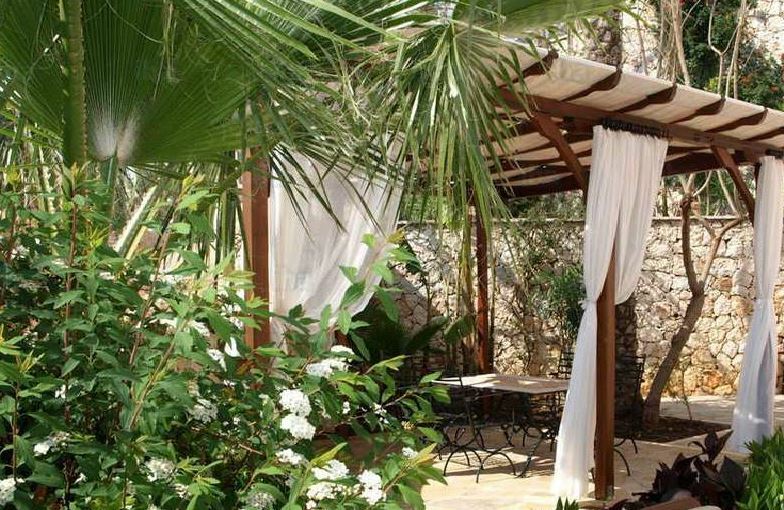 Curtain tracks and curtains not only provide functionality, they can also enhance the look of your outdoor space. This concept is so popular, we've even written a few blog posts about it. So as the summer starts to wrap up, the leaves begin to change and the temperature drops, now is the perfect time to complete a project like this allowing you to enjoy the outdoors weeks longer than you did in years past. Should you have questions or need assistance in selecting the best products for your project, our team of customer service experts are here to help. Simply give us a call at (888) 434-7444 or email. Happy summer! 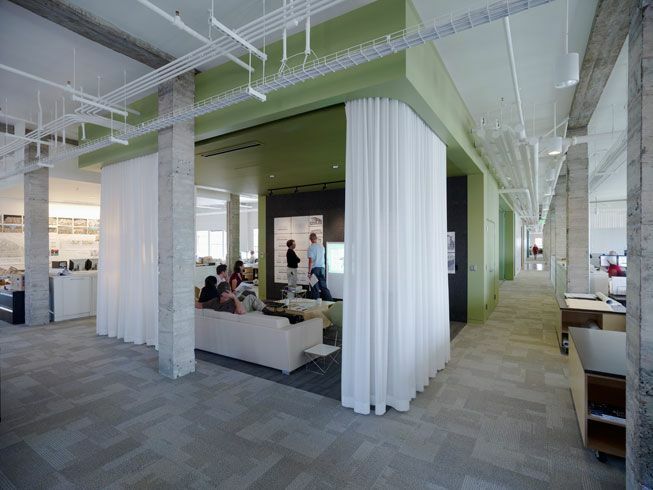 We've recently read a few articles discussing the many downfalls of open office spaces. A recent article in The Journal Times shares, "Across America, companies have torn down walls, built big open spaces, and designed work environments to make it easier than ever for staff members to talk. But what's been the effect of all of these open spaces? A series of new studies suggest that open workspaces aren't all they're cracked up to be. In fact, opening up offices may actually have the effect of decreasing communication and hurting productivity rather than helping it." What this article, and several other we have read, is trying to say is this kind of environment actually decreases face-to-face communication. But if you have an open office space, what are you to do? Start building walls? This can be time consuming and expensive. However, there is a solution that allows you to break up an office space when needed or open it up for large meetings: curtain walls. Curtain walls can divide a space into smaller offices and conference rooms for brainstorming sessions and we have everything you need! The 6200 Heavy Duty I Beam is a strong track that can be mounted to the ceiling or the wall with the appropriate brackets and can divide the room beautifully. The 6100 F6100 Flexible Track on the other hand, is great for creating a few cubicles. Adding Eclipse Light Blocking Curtains to the curtain tracks will help also absorb sound so larger meetings don't disrupt others working at their desks. Imagine doing this project over a weekend and having your team walk in on Monday. Do you think they would love it? If this is a project you are considering for your office space, contact our Customer Service team at 1-888-465-0274 and we can help you. 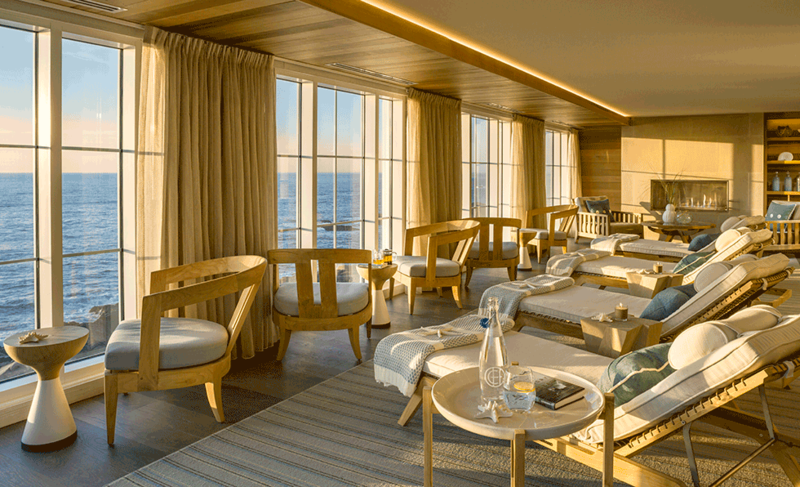 We love a great awards program and Hospitality Design (HD) magazine recognizes the best of the best. They recently announced the winners of the 14th annual HD Awards. There are 23 categories and there are a number of commercial installments that feature elegant utiltization of curtain track hardware in their design. 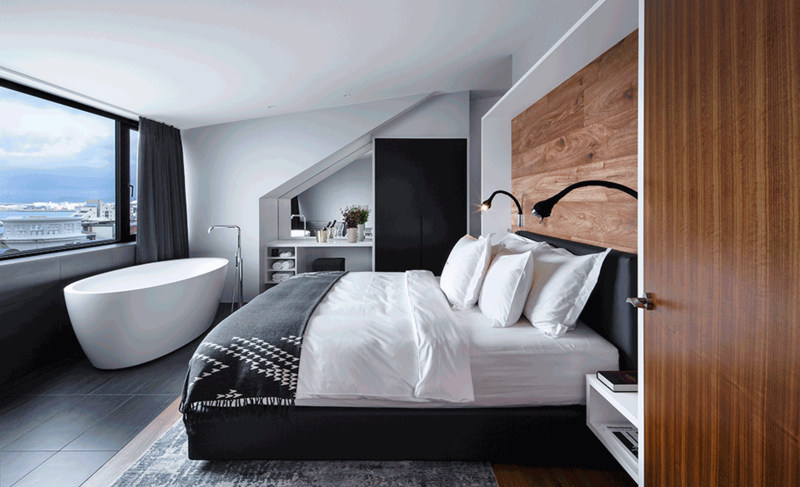 We wanted to share some of the winners and their use of curtain tracks, drapery hardware and accessories. The photos are simply stunning. Congratulations to all of the winners! If you are looking for design ideas and inspration for your next interior decorating project, check out the winning project photos here. Curtain tracks aren't just for window curtains. 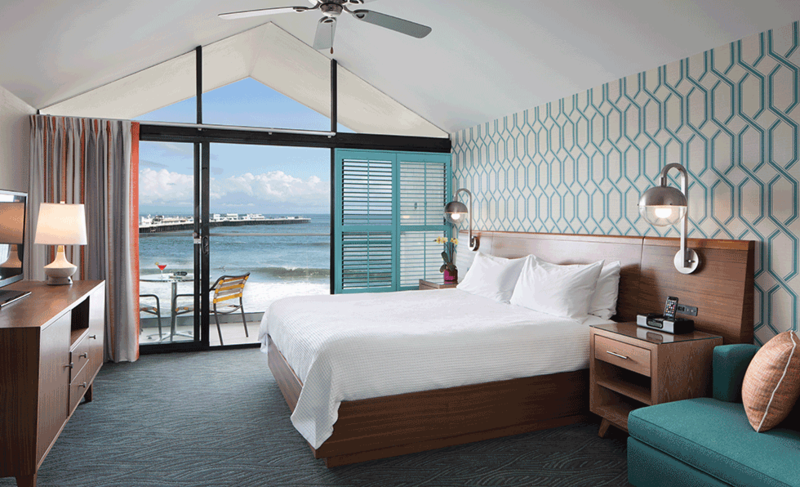 Many interior designers use fabrics to accent features of a room beyond just the windows. 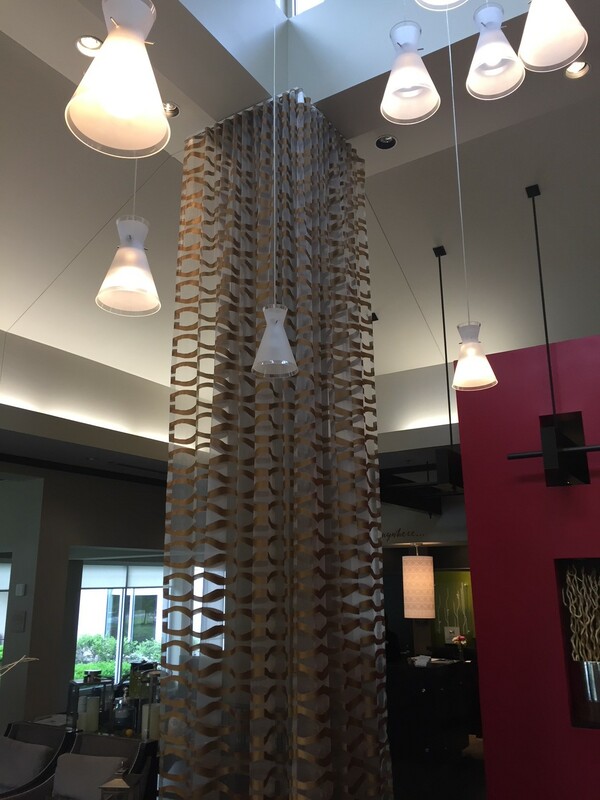 Decorative wall panels are one option, and here, fabric panels were hung with 84004 track and 84106 wheeled snap tape carriers to give this hotel lobby a striking feature while enhancing the look of a traditional column. The corded carriers give the panels a beautiful, consistent ripple fold pleat look. The 84004 Ball Bearing Carrier Curtain Track works extremely well for this project. It is a ceiling mount aluminum architectural track that accommodates smooth rolling ball bearing carriers. Available in white or silver, it comes in 8 foot sections which can be mounted end to end for wider spans. Pairing this track with the 84106 Wheeled Snap Carrier, it allows for easy movement. Available in white or black nylon, the snap pendant rotates in a wheeled base. 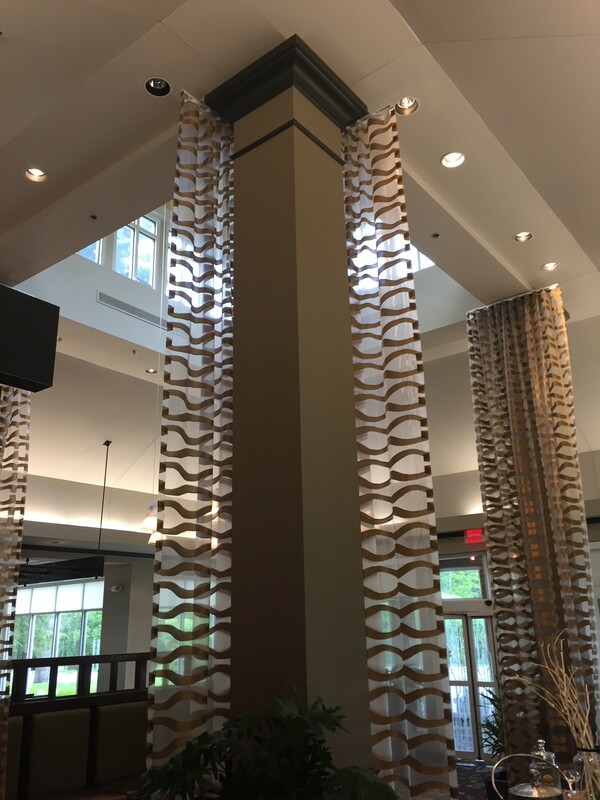 By adding these panels to the columns, the decorator turned the entire look of the hotel lobby around. We think it makes quite the first impression. 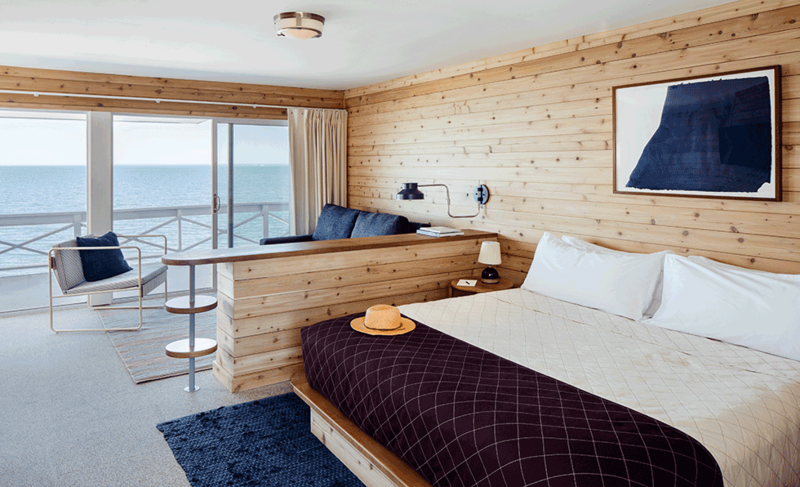 Whether your project is in a home, hotel, hospital, RV or boat, curtain tracks can be used in many ways. If you are an interior designer and are in need in curtain tracks, hardware or accessories, we would love to help. We also have a "To The Trade" discount program intended for Interior Designers and Architects and we invite you to contact our customer service team at (888) 434-7444 to learn more. 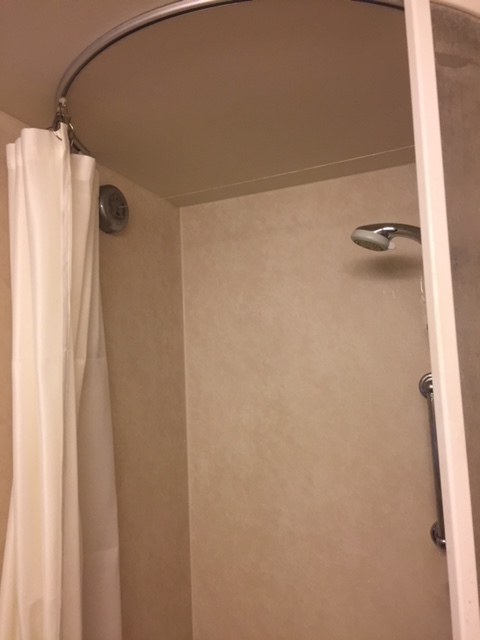 Showers in boats typically aren’t very big, and that’s okay. You don’t need a large space to take a quick shower when out at sea. For these spaces and to help keep the water contained, we recommend our 6100 Flexible Curtain Track. This track works extremely well in small spaces and is sold by the foot. It bends by hand without compromising strength and can be ceiling or mounted on the wall. Our 6111 Flexible Curtain Track Carriers are white plastic wheel carriers with metal loop, sold individually, and work smoothly with the 6100 Flexible Curtain Track. Add the Recmar 7142 Steel Curtain Hook, steel J shaped curtain hooks that are 1.5 inches long and easily attaches to any carrier with a ring to allow for curtains with holes or grommets, plus shower curtains, and your shower is ready to go. Should you need custom curtains to fit the space, we can make them for you from a wide variety of fabrics and colors. If you already have a shower in your boat and just need replacement parts, chances are, we have exactly what you are looking for. If you are starting new, you don’t have to overthink a project like this. Our friendly customer service team is here to help you every step of the way. And of course, if you have completed a boat shower project, we’d love to see your photos!